Dasara is celebrated all over India as a religious as well as a social festival. Nava means nine and rathri means night and so Navarathri means nine nights. Some call it as Navarathri, some as Vijaya Dashami, and some as Dussehra. Doesn’t matter what you call, does it? This year Dasara is celebrated from October 10th – October 18th. Please check the dates in the country you are residing. From day one of the festival, it is customary to keep a Kalasha (ಕಲಶ), this is filled with water(ನೀರು) and 4 betel leaves(ವೀಳೆದೆಲೇ) are arranged as shown below in the pictures.Apply Haldi (ಆರಿಶಿನ) , Kumkum(ಕುಂಕುಮ), and flowers, gejje vastra (ಗೆಜ್ಜೆ ವಸ್ತ್ರ) as shown again. This Kalasha is kept in front of the Pattada Gombe (ಪಟ್ಟದ ಗೊಂಬೆ) which is given during the marriage to the bride. This ಪಟ್ಟದ ಗೊಂಬೆ signifies Lord Srinivasa and Goddess Padmavathi. Again, see pictures below. These ಪಟ್ಟದ ಗೊಂಬೆ are decorated with different jewelery, crown, bangles, dresses every few years. 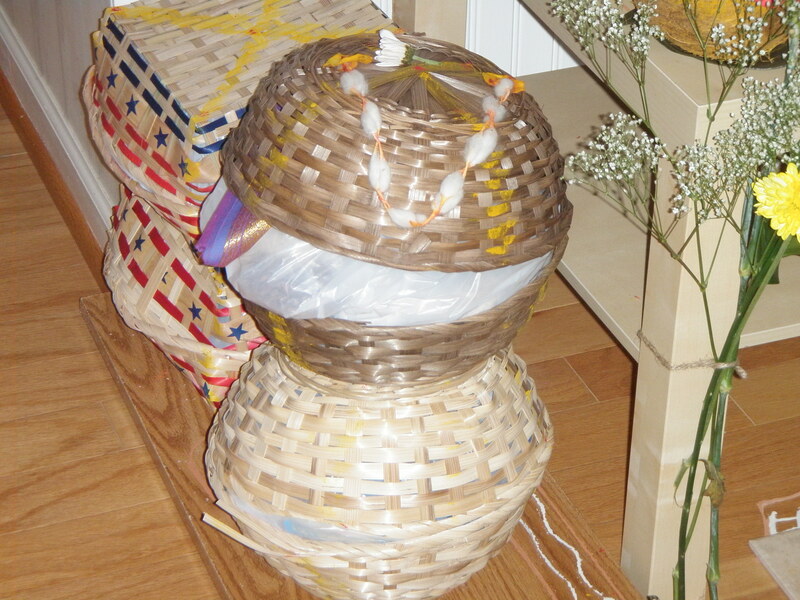 If you are keeping an elaborate Gombe (Dolls), than the Kalasha and the Pattada Bombe are placed on the top shelf. And all other arrangements follow next. Even though all the 10 days and nine nights are important, there are a few major days where pooja is done with great devotion and pomp. 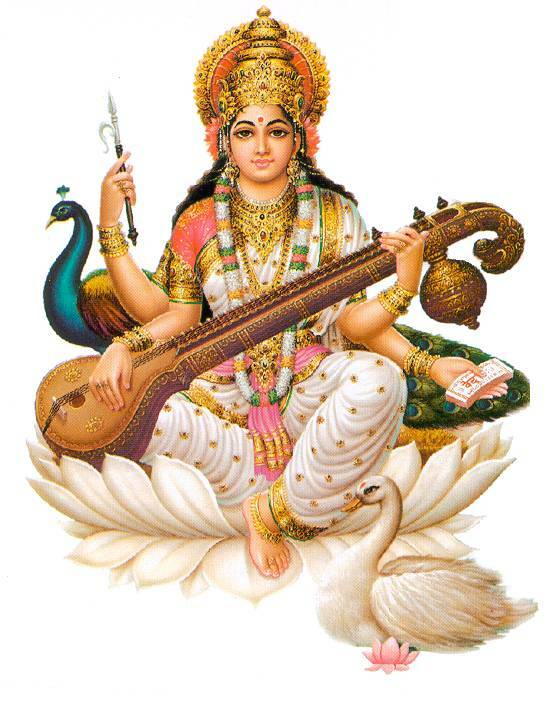 Read more about Saraswathi Pooje here. 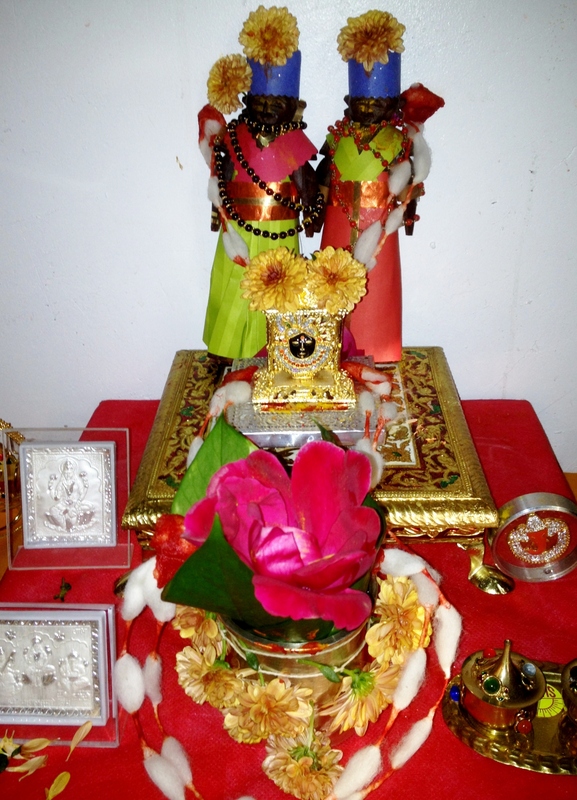 Ayoodha Pooja – Mahanavami – October 18th. Read more about Ayoodha Pooja here. Ms. Aparna Achar sent me this email inviting all of us for Dasara Doll Display at her home. Attached below is part of Ms. Aparna’s emails and the invitation. Please visit if time permits. Thanks Ms. Aparna for the invite. My name is Aparna Achar and I live in Bangalore. I have been diligently reading your posts and feel enriched by the information and experiences that you share. I have a small request. 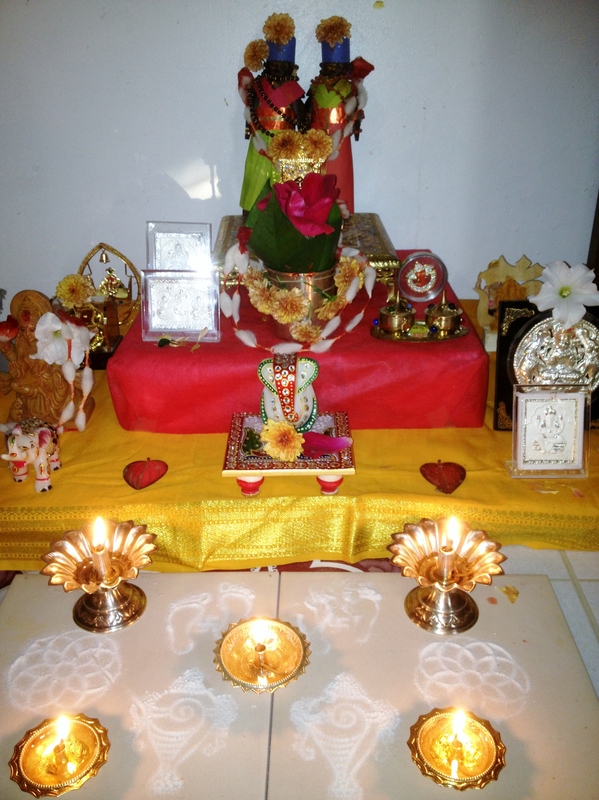 We do an elaborate Dasara dolls display in our house and during this nine day period, we have pravachana, bhajans, etc so as to give a positive vibration in the house and also do some dharma karya. I would be happy if any of your blog readers from Bangalore are interested to visit our house to see the display. We have enumerated the Ramayana, Krishna Leela, besides Indian cultural aspects. We have also maintained the tarathamya of Dvaita philosophy in our arrangements. May I request you to post this invite in your blog so that is any of your readers and well wishers are keen, they can call and come to our place. We will be keeping the dolls display till 15th October. If any group is interested in conducting bhajans or lakshmi shobanae, we would be happy to host them. As a kid, I grew up listening my parents recite Shri Venkatesha Parijatha, Sreenivasa Kalyana during the Dasara days. Last time I visited India, I went to Vidya Peetha to get these books. However, they were not available. Yesterday, in our whataspp group message Mrs. Anita Kulkarni asked me about this. I said I had listened to it as a kid but had not got the books. She immediately sent me the links for the audio. It is unbelievable how the internet and the world has changed. I was able to listen Part 1. Hoping to listen each part every day until the final Vijaya Dashami day. Thanks Anita Avare. Here are the links for the audio. Check the mypanchang.com for exact dates of festivals in the country you live in. Mr.B K T Raju shared an image for important dates such as festival lists, Ekadashi and Aaradhane dates for 2016 and 2017. This is very handy and can be saved in your smart phones, laptops and desktops. Thanks Sir for the list. This is amazing. It also has Ekadashi dates. P.S: Make sure you check with your local calendars for some changes in dates. I have tried to translate as much as possible. If there any mistakes, please let me know. Mr. Krismaly had commented here on the blog and left a message. It is a great article to recognize the significance and importance of giving ಮರದ ಬಾಗಿಣ Maradha Bhagina. I will try to translate this once I have some time. I had posted an earlier article on what is included in the Marada Bhagina a while ago. See the link below. ಮರದ ಬಾಗಿಣದಲ್ಲಿ ಹಾಕುವ ಪದಾರ್ಥಗಳು ಮತ್ತು ದೇವತೆಗಳು., Items to be put in the Bhagina. ಮುತೈದೆ ದೇವತೆಯರು೧೬ ಜನರು. ಇವರನ್ನು ಷೋಡಶಲಕ್ಷ್ಮೀಯರು ಎಂದು ಕರೆಯುತ್ತಾರೆ..
Married woman are equal to 16 people.They call them Shoda Lakshmi. ಗೌರಿ, ಪದ್ಮ, ಶುಚಿ, ಮೇಧಾ, ಸಾವಿತ್ರಿ, ವಿಜಯಾ, ಜಯಾ, ದೇವಸೇನಾ, ಸಾಹಾ, ಮಾತರಲೋಕಾ, ಮಾತಾರಾ, ಶಾಂತೀ, ಪೃಥ್ವಿ, ಧೃತೀ, ತುಷ್ಟೀ, ಸ್ವಧಾದೇವಿ..
Gowri, Padhma, Shuchi, Medha, Savitiri, Vijaya, Jaya, Devasena, Saha, Mataraloka, Matara, Shanthi, Pruthvi, Druthi, Tushti, Swadhadevi. ಸೀರೆ ಸೆರಗಿನಲ್ಲಿ ಮಹಾಲಕ್ಷ್ಮೀಯು ಸೌಭಾಗ್ಯ ರೂಪದಲ್ಲಿರುವುದರಿಂದ ಸೆರಗು ಹಿಡಿದು ಮರದ ಬಾಗಿಣ ಕೊಡುತ್ತಾರೆ..
Goddess Lakshmi resides in the saree pallu, and that;s why you should hold the pallu and give the Bhagina. ಮರದ ಬಾಗಿಣಕ್ಕೆ ಸಂಸ್ಕೃತದಲ್ಲಿ ವೇಣುಪಾತ್ರ ಎಂದು ಕರೆಯುತ್ತಾರೆ..
Maradha Bhagina is called as Venu Patra in Sanskrit. Lord Narayana resides in Maradha Bhagina. ದಂಪತಿಗಳು ಲಕ್ಷ್ಮೀ-ನಾರಾಯಣರ ತರಹ ಇರಲಿ ಅನ್ನೋ ಕಾರಣಕ್ಕೆ ಮತ್ತು ಸುಮಂಗಲಿ ತನ ಯಾವಾಗಲೂ ಇರಲಿ ಅನ್ನೋ ಕಾರಣಕ್ಕೆ ೧೬ ಸುಮಂಗಲೀ ದೇವತೆಗಳ ಸಾಕ್ಷಿಯಾಗಿ, ಬಾಗಿಣ ಕೊಡುತ್ತಾರೆ.. Since the Maradha Bhagina symbolizes Lord Narayan and Lakshmi Devi, it is given to married women so they can live a happy married life like Lord Narayan and Lakshmi Devi, and is given to 16 married women. The 16 Goddesses are Nitya Sumangalis. ಈ ೧೬ ದೇವತೆಗಳು ಸಂಸಾರದಲ್ಲಿ ಯಾವುದೇ ತರಹದ ಕಷ್ಟ,ನೋವು,ದುಃಖ ಬಂದರೂ ನಮ್ಮನ್ನು ರಕ್ಷಿಸಲಿ ಎಂದು ನೆನೆದು ಬಾಗಿಣ ಕೊಡಬೇಕು.. Given the Maradha Bhagina so that the 16 Goddesses will protect you from any difficulty, any sorrow. ಈ ೧೬ ದೇವತೆಗಳನ್ನು ಸ್ಮರಿಸುತ್ತಾ ಸ್ವರ್ಣಗೌರೀ ಹಬ್ಬದಲ್ಲಿ ಮಾಡುವ ಹೋರಾಪೂಜೆ, ಎಂದರೆ ದಾರಕ್ಕೆ ಮಾಡುವ ಪೂಜೆ..
೧೬ ಅರಿಸಿನ ದಾರ, ೧೬ ಗಂಟುಗಳು, ೧೬ ಬಾಗಿನ, ೧೬ ಎಳೆ ಗೆಜ್ಜೆವಸ್ತ್ರ, ಪೂಜಿಸಬೇಕೆಂದು ಗ್ರಂಥಗಳಲ್ಲಿ ಹೇಳಿದ್ದಾರೆ..
೧. ಅರಿಸಿನ ದಾನ : ಅರಿಸಿನ ದಾನ ಮಾಡಿದಷ್ಟು ರೋಗ ನಿವಾರಣೆ ಆಗುತ್ತದೆ..
ಸುಮಂಗಲಿಯರಿಗೆ ಸುಮಂಗಲಿತನ ಯಾವಾಗಲೂ ಇರಲಿ ಎಂಬ ಉದ್ದೇಶಕ್ಕೆ ಮೊದಲು ಅರಿಸಿನ ಕೊಡುತ್ತಾರೆ..
By giving Turmeric as Dhana, it will help relieve any disease. It will help women live as married women. ೨. ಕುಂಕುಮ ದಾನ : ಕುಂಕುಮವನ್ನು ಯಾರು ಧರಿಸುತ್ತಾರೋ ಅವರು ಬಹಳ ತೇಜಸ್ಸು ಮತ್ತ ನಂಬಿಕೆ ಜಾಸ್ತಿ ಆಗುತ್ತೆ..
By giving Kukkum, it will help increase the belief on God. Help cure eye sight. ೩. ಸಿಂಧೂರ ದಾನ ; ಸತಿ ಪತಿ ಕಲಹ ನಿವಾರಣೆ.., ರೋಗಭಾಧೆ,ಋಣಭಾದೆ, ನಿವಾರಣೆ..
ಮನೆಯಲ್ಲಿ ಸಂದೇಹ, ಒಳಜಗಳ, ಮಾಂತ್ರಿಕ ದೋಷಗಳು ನಿವಾರಣೆಯಾಗುತ್ತದೆ ..
By giving Sindhoor, it will help cure diseases, misunderstanding between husband and wife, and any misunderstanding between any relatives.